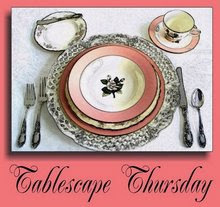 Today we have Susan @ Between Naps on the Porch to thank for this wonderful Tablescape Thursday. 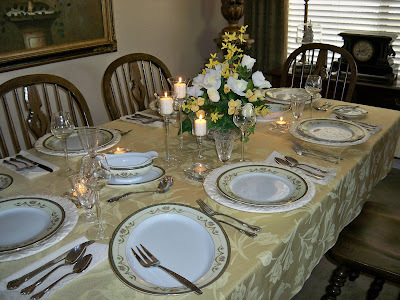 Be sure to visit her blog and see the gorgeous tablescape she has created and all the other participants. 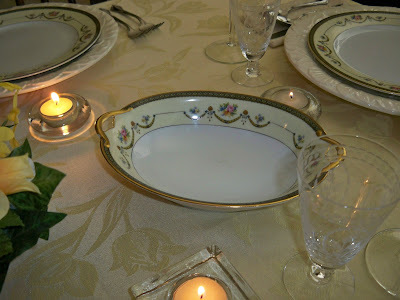 You will find some really gorgeous tablescapes. My tablescape today features my newest thrifty dish find. It is a set of antique china. I looked the pattern up on Replacements and they say the pattern was made between 1921 and 1924. It is Noritake - Marigold. The stemmed candle holders came from my GW. There were 4 of them and I broke 1 on the way home. Boo-hoo. Oh well, three works well. 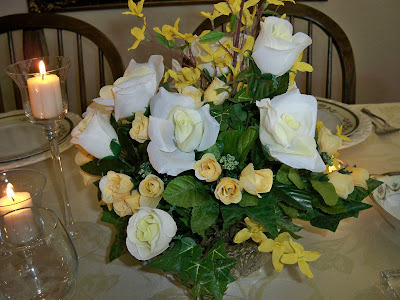 The floral arrangement is done in a cut glass bowl with white and yellow roses, ivy for filler and forsythia. I wanted to keep everything in tones of yellow and cream. 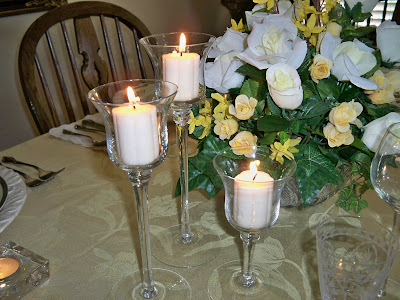 The candles and flowers were kept low enough for easy conversation across the table. The candles really light up the little yellow rosebuds. When I found the dishes there were 8 plates, 2 bread and butters, 1 platter, a gravy boat and 1 serving bowl. They are all in perfect condition. I set the table with all of the serving pieces. This pic shows the large oval platter. A picture of the lovely plates. They have a very soft yellow border with swags and small roses. There is a very intricate border near the edge and then banded with a very heavy gold edge detail that wraps part way around the bottom of the edge. You can click on any pic to enlarge and see the detail. 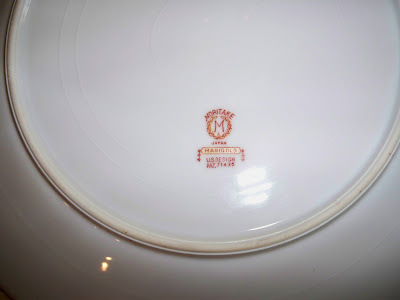 The back of the plate says Noritake - Made in Japan - Marigold - U.S.Design - Pat.71436. The charger is a heavily embossed cream floral design that I found at Ross. 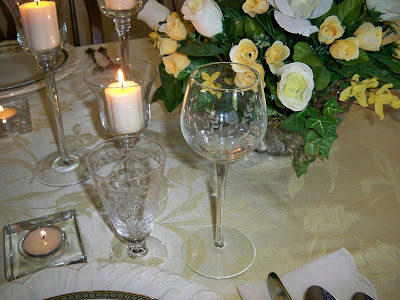 Etched crystal and an individual tea light rounds out each place setting. 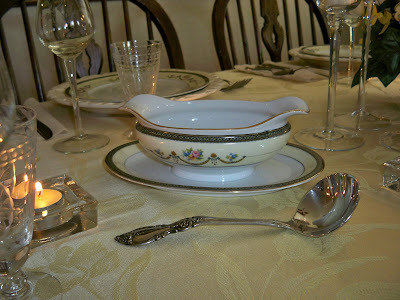 The gravy boat has the saucer attached and is so finely detailed. The serving bowl shows how really heavy the gold detail on the border is. Such pretty and delicate pieces. A final view of the table with the candles aglow. 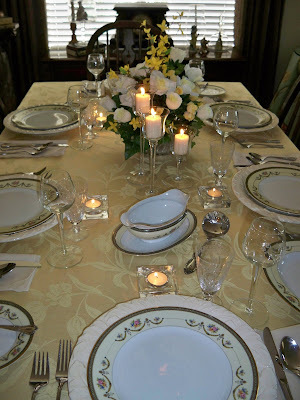 The yellow tablecloth really emphasises the soft yellow tones of the china. I purchased this wonderful china for only $39.99 and the Replacements value would be over $250.00. Gotta love it when you find a real bargain. Yippee!!!! Some of you have asked how can I find so many bargains. I live reasonably near Sun City and Sun City Grand. There are very frequent Estate Sales as the elderly living there either pass on or go into a home. If something doesn't sell it is donated to the local GW near there. It always makes me a little sad to see some precious lady's things at the GW, however I hope it would please her to know that when I find them I do care for and love them. They all become wonderful treasures to me. Thanks for stopping by. I always look forward to your visits. Please come again soon. Beautiful. You sure got a great find with this china. I feel exactly the same way about estate sales, but I think you are right about finding them a new home where they are loved just as much. * WOW! You sure know how to SHOP! 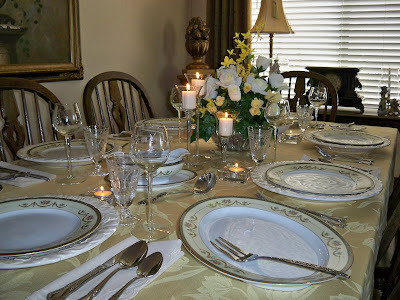 And I so enjoyed seeing all the soft colors you put together in your tablesetting! Marty, your china is so pretty and elegant. What a wonderful find. The yellow and cream theme is just beautiful. Just gorgeous! This is so nice. I really like your table cloth too. My favorite are the chargers I think....they're so versatile and can use them with any setting. I so need a gravy boat like that one! Did you do your floral arrangement too? Pretty all of it. Great job as are all of your tablescapes! Wow, Marty, those dishes are GORGEOUS!!! What a terrific find! 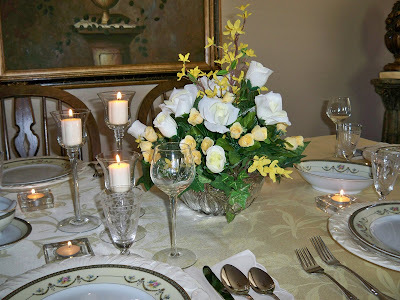 And you have set such a beautiful table, with the soft creams and yellows. Class and elegance! Love that pattern. 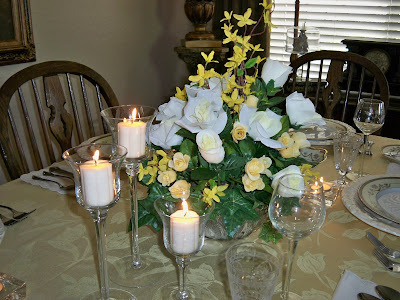 Very elegant tablescape! Thanks for sharing and have a great day! Oh Marty - this is so beautiful. 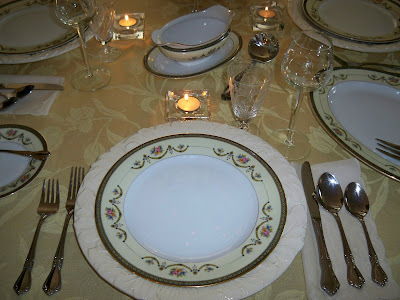 Those new dishes are lovely - this is just a perfectly done tablescape of elegance. I'm going back to look again! Marty this is absolutely lovely. I love how you have pulled all the creams and yellows together. The dinnerware is very special. The mark caught my eye right away. I collect Occupied Japan Dog figurines, so I am familiar with the dating of Japanese marks. I can tell you these dishes were made some time in 1930's. At that time Noritaki was designing for the American market in New York. Great find! What an elegant table. Those dishes are lovely and what a great bargain you found! 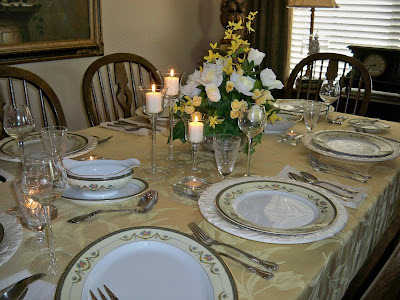 LOve this pretty yellow tablescape, Marty! Sunshine, like you! It's such a pretty elegant table. Oh how elegant; everything looks so lovely! I enjoyed my visit with you! Stop by and browse a while. If you like what you see, please be sure to click the "Follow" button so that we can inspire one another frequently! Yellow and cream - you are a woman after my own heart!! It is all so very lovely! I enlarged a pic and saw the pretty details on a plate. What a wonderful bargain you found! OMW...I love the Noritake - Marigold pattern. And to get the set is so nice. I like the shape of the serving dishes in older sets of china, so nice a graceful! And I love the gravy boat! Great find and I know you love it! I also like the tall tea candles, such a nice touch. Lovely! 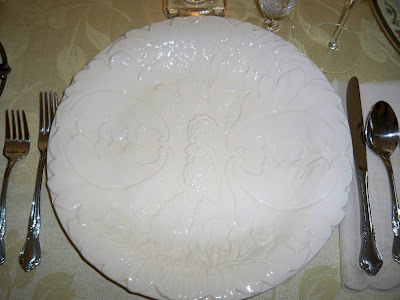 My mom's china was Noritake, no name just a number..from 1935..It was graceful like yours. It would make me happy to know someone was taking care of my china, like you!